The problem remains open, the prize of $172 unclaimed. A few weeks ago I had a momentary fantasy that I might have come upon the answer. I was browsing in a strange New England emporium called Building 19, full of merchandise found nowhere else (thankfully). 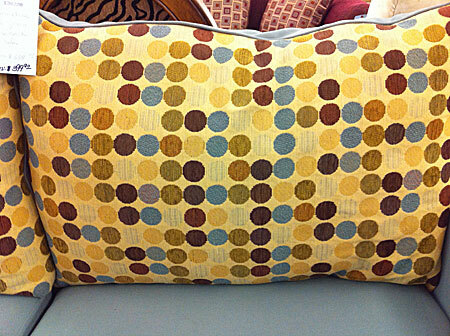 From across the room I spotted a sofa cushion that looked like it might well be a rectangle-free four-colored grid. Sadly, a closer look showed that the cushion is neither rectangle-free nor four-colored. Nor 17 × 17 for that matter. And the price tag reads $399.90, so if Bill wants to receive the solution in the form of tacky furniture, he’s going to have to up his offer. On the other hand, the hardest level (“Ninja”) in Schweitzer’s game is only a 12 × 12 array, so don’t think you’re going to click away at little colored squares and earn yourself $289. The program requires a canvas-capable browser, such a recent version of Chrome, Firefox, Opera or Safari. I beat the Ninja level fairly easily after a few minutes of clicking and a couple of heuristics, but the only thing I learned in the process is that humans are terrible at this game because I can’t help interpreting the board as closer to solved if the rectangles are smaller (since there is less red).